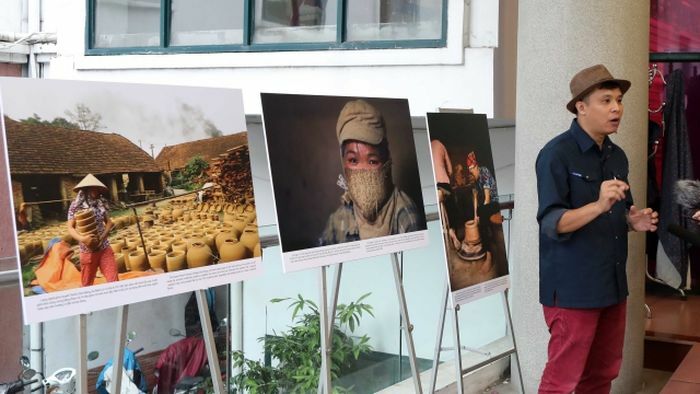 NDO – Photographer Le Bich, who is appreciated for his acclaimed photo collections of Vietnam’s folklore culture and festivals, is holding an exhibition entitled "Colours of Life’ at the Vietnamese Women's Museum in Hanoi, with 40 pictures on display capturing how Vietnamese women use their craftsmanship to preserve the cultural heritage of their villages. The product of twelve years of numerous visits to traditional craft villages across Vietnam, the exhibition presents a passionate look of Le Bich into the life and people in the villages. Question: After years travelling across the country, what do you think about Vietnamese women? Photographer Le Bich: I have an American friend who is a photographer. When he came to Hanoi, he was surprised to see that many Vietnamese women are doing jobs which are often taken by men. I grew up at a time when our country was in its restructuring process after war, when women worked as hard as men. They were seen everywhere from construction sites to remote areas for cultivation, making significant contributions to the country’s construction and development. In today’s life, a lot of Vietnamese women leave their home town in rural areas to head to big cities, embracing every hardship to earn a better income and improve the lives of their husbands and children. Women have also played an important role in many traditional craft villages in Vietnam, not only in preserving the crafts but also in regulating the household economy. Can you tell us about the photographing of the pictures on display at the ‘Colours of Life’ exhibition? My memories and work experience supported me during the over past 12 years in preparation for the exhibition. I tried my best to photograph my characters in the most natural way, from their working environment to daily activities. Women’s beauty shines when they are working. Vietnamese women always keep working for their families and fatherland, and I highly respect and love that virtue. Why did you choose women as the major theme of the exhibition? I took up photography in 2005 with a focus on such topics as cultural heritages, traditional culture in villages, and traditional craft villages. After more than ten years collaborating with a number of newspapers at home and abroad when I had gained enough experience, I hosted my first solo exhibition, ‘Colours of Life’. The exhibition on the theme of Vietnamese women is part of my grand collection on the country’s traditional craft villages. I presented all of the exhibits and their copyrights to the Vietnam Women’s Museum for display. Do you find folklore culture a diverse material to establish a position in your photography career? Vietnam possesses rich culture with 54 ethnic groups, which is a huge treasure. The more I work in this field, the more I become interested in it. Vietnamese culture can be traced down and observed clearly through indigenous culture practiced by locals in villages, communes, and hamlets. Therefore, abandoned wells, spring festivals, traditional customs and folk paintings become charming images which attract me the most. The more I search for Vietnam’s national identity, the less knowledgeable I feel about myself, so I chose photography as my language. It is not only a strong way of capturing impressions but it is also convenient for archives. Being published in newspapers, holding exhibitions, and printing books are the best ways for archiving and sharing. Your photos have shown that there are many craft villages which have been forgotten in today’s life. Do you think that you are now working as a memory keeper? The development process might break down traditional values in villages and communes. It is an inevitable rule. So I think that it is better if we take immediate actions to preserve and safeguard our traditional values. I am a member of a photojournalist club, most of the club’s 70 members are working in current affairs, economics and entertainment. A few of them follow the themes of traditional culture. I have met with many people working in the museum sector and researchers, who say that they lack a good source of documentary photos on traditional culture and the fading of ethnic minority groups’ culture. Many beautiful things in the past are disappearing in today’s life. In many craft villages, there is only one craftsman still standing. In many villages, the shines are so downgraded that it could collapse in the very near future. In many localities, traditional festivals have changed far from their original version. Many good behaviours and codes of conducts have disappeared. Therefore, the recording and preserving through documentary is absolutely necessary. And I am volunteering to work as a memory keeper. In the time to come, I will stage a photo exhibition on traditional craft villages of minority ethnic groups, such as Tay, Nung, Dao, H’Mong, Cham and Khmer. I hope that the event will help Vietnamese culture lovers learn more about the uniqueness of ethnic tribes. I will also plan two other exhibitions, one on the last craftsmen of Vietnam’s folk paintings and the other on Vietnam’s ancient wells and the stories about them. In addition, I will introduce a photo book on Vietnam’s folk paintings, which I co-created with two other authors.